This week we highlight three similarly-themed titles, and a collection of Bach cantatas for solo voice (with a concerto for oboe d’amore guest-starring in the middle). Sibelius. Performed by Leif Ove Andsnes. 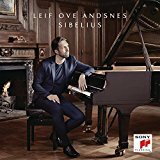 Norwegian pianist Leif Ove Andsnes puts together a repertoire of not-often-heard Sibelius solo piano music. “‘Everyone was astonished that there could be a major composer out there with such beautiful, accessible music that people don’t know. These are intriguing works with the wonderful Sibelius qualities we know. I really believe in this music and I want people to hear it.’ Leif Ove Andsnes” (back cover). Beethoven. Performed by Evgeny Kissin. Presto Classical’s disc of the week for August the 25th. Recorded live over ten years between 2006 and 2016, this double-CD album presents some of Beethoven’s most well-known piano music – the Moonlight, Appassionata, and Les Adieux sonatas, plus the challenging no. 32. This is Kissin’s first solo recording in over a decade. Ibert. Performed by the Orchestre de al Suisse Romande and Neeme Järvi. 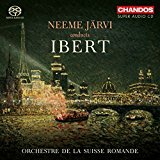 “This fourth album from Neeme Jarvi and the Orchestre de la Suisse Romande explores the music of Jacques Ibert. Although Iberts work is starkly contrasting from piece to piece, all of his compositions show his deftness with their strong melodic lines and vigorous ostinato patterns. These recordings were taken in Genevas Victoria Hall, and the outstanding acoustics are easily heard on this recording” (Amazon.com). Cantatas for Bass, Johann Sebastian Bach. Performed by Matthias Goerne. “In composing his cantatas for solo voice, Johann Sebastian Bach magisterially combined two elements that might seem irreconcilable: strict devotion within the framework of weekly Lutheran worship and vocal virtuosity, served by skilful highlighting of the voice. The result is a style in which the expression of the sacred Word is raised to a peak of intensity – notably when a voice like Matthias Goerne’s tackles these two famous cantatas for bass, giving them all the lustre of rare pearls!” (back cover). Next Post Haven’t a clue what to do these school holidays?